When starting a recent project at a client’s Ocean City, Maryland, home, interior designer Phillip Smith wasn’t looking to create an obvious beach home feel. “When you are at the beach, it’s hard to convey beach without screaming it,” he said. Smith focused on color, reflective objects and natural fibers to tap into the spirit of the beach without being too obvious. It was an approach that worked for his clients, a Catonsville, Maryland, couple, who liked it so much that what began as a small bathroom remodel turned into a redo of their three-bedroom home. Moreover, it highlighted the fact that it’s possible to achieve a beachy look without resorting to gimmicks like seashells, anchors or bushels of crabs. Designer Stephanie Gamble also created a subtler “beach feel” in the main floor of her clients’ 1930s’ three-level Annapolis, Maryland, home — without even setting out to do so. “We didn’t intend for it to be coastal; it just worked out that way,” said Gamble, owner of Baltimore-based interior design company The House Downtown. Gamble said details such as anchoring the living room with a neutral-colored sofa and hanging artwork in hues of blue, green and white made the home feel like a property in Ocean City or the Outer Banks. 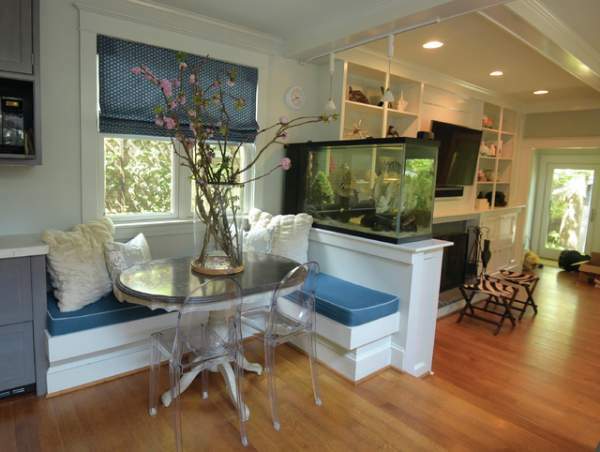 Gamble worked with a lighter color palette, which wound up giving the home its “coastal” feel. You can follow Gamble’s and Smith’s examples to transform your digs into a comfy beach pad without being too gimmicky. Restraint, Gamble said, is key. Here are more tips from the interior designers on how to create an understated beach look in your home. He suggested painting cabinets white or adding watercolor prints to bare walls. “You look at those and you get the feel of waves, and the colors are reminiscent of water,” he said. Another great way to incorporate color and get that beach-like vibe is through art, according to Gamble. Barry & Diane Evans and their team had a professional manner, showed accessibility, great advise, were timely and available.